Make time for something just for fun, such as the panels happening at the Pop Top Stage. There are days when all the plans work. I love those days. This was pointedly not one of them. I had carefully planned out sessions that I wanted to get to today. It was a lovely mix of things that would have been helpful for my own particular niche library. However, when I went to check the meeting room for my first session of the day, I learned that it was not at the conference center, but one of the satellite hotels instead. If I had thought more clearly, this would have been a nonissue. Not bothering to check until 15 minutes before the session started meant that there was no viable way to get there in time. Add in a headache born from multiple days of overstimulation, and I was left with the chucking large portions of my carefully planned schedule out the window. Going planless is typically a terrifying option. Today, on the other hand, worked out surprisingly well. After I jettisoned my morning plans, I decided to walk the exhibit hall at 8:45 in the morning. You know when is a great time to visit the exhibits? 8:45 on Sunday morning. The crowds are thin and the vendors freshly caffeinated. I had power walked the exhibit hall before, but with my newly freed hours, I was up for an exhibit stroll. I stopped and discussed things with vendors I was interested in. More importantly, vendors stopped me. Booths that I wouldn’t have thought could benefit me led to interesting conversations and opened doors to new ideas. What I had written off as being a failed morning due to my own scheduling errors ending up being an exciting exploration of new and previously unthought of opportunities. After my exhibit tour, I was ready to dive back into the parts of my schedule that still held. I’ll be mulling over one session of my altered schedule for quite a while. “Collecting Library Data: Policies and Data Management Procedures and Improvement” was a fascinating discussion of the balance needed between ethics of personal privacy and the desire to dig deep into user metrics to better serve our communities. 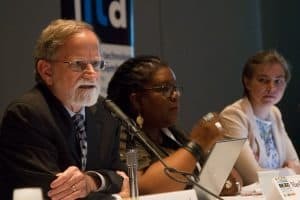 Jenica Rogers of SUNY at Potsdam did survey that demonstrated faculty’s desire for deep levels of user data and student’s desire to keep their data private. Sara Mannheimer of Montana State University dug directly into the professional ethics of skimming any user data, particularly in a profession that has long advocated privacy in information access. 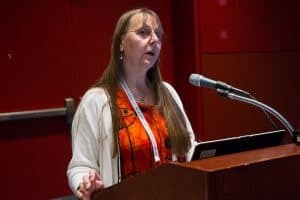 The session rounded off with Kristin Briney of the University of Wisconsin-Milwaukee laying out the steps for creating a plan for data usage. Briney contends that that having a plan for data gathering and disposal before it is harvested allows for greater safety for the patrons as well as the library. There is one more element of my second ever day at ALA that needs to be pointed out. If you have not yet stopped by at least one of the small stages in the back of the exhibit hall, do so. 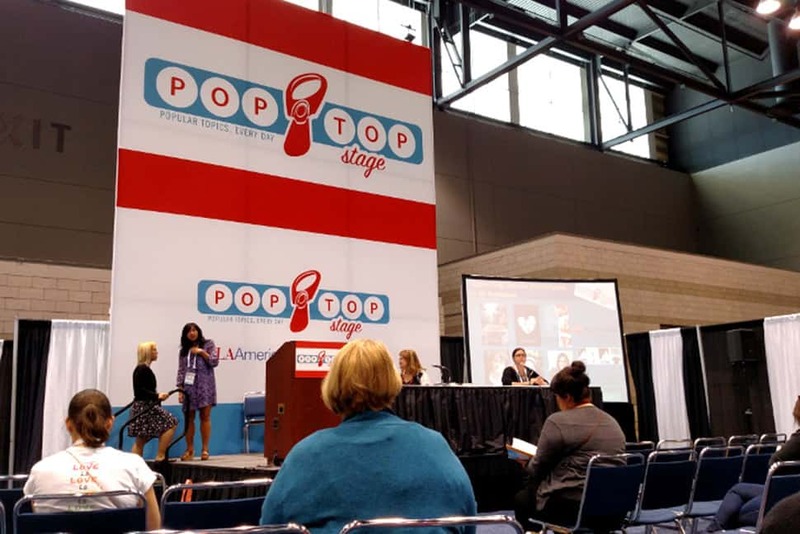 On a whim, I decided to eat my lunch while watching the “Subverting Gender Stereotypes in YA Romance” author panel on the Pop Tops stage. I had planned my convention to be serious, an attempt to justify the days away from my desk. But when plans fall apart, fun finds its way in. Three authors talked about the ways stereotypes have shaped romance novels and the ways they like to subvert those tropes. And there is most definitely room for that even in a schedule dedicated to trying to pass as a true professional at your first Annual. ATHINA LIVANOS-PROPST is digital librarian at PBS Education in Arlington, Virginia.